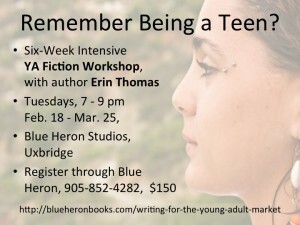 As mentioned in a previous post, I’ve been invited to teach a course in writing YA Fiction through Blue Heron Books in Uxbridge. And last month, at the January CANSCAIP meeting, I heard a panel of absolutely fabulous writing instructors — Anne Laurel Carter, Sharon Jennings, Cathy Rondina and my own teacher, Peter Carver — discuss their experiences and ideas around teaching writing. So of course I’m thinking now about what it is I love about writing classes, both as a student and as a teacher, as I put together this new course. I’d never thought about writing for children before, but who doesn’t want to take a course from Yoda? So I signed up for Peter Carver’s entry-level class, run out of Mabel’s Fables, a children’s bookstore in Toronto. That was my introduction to children’s books in Canada today… in a colourful, book-crammed wonderland, at the hands of a rather tall, lanky Yoda, whose passion for children’s literature is second to none. He taught us all to write better, yes, but he also shared his love of all things book-related. He introduced us to some of the best books being published at that time, and showed us how inspiring and wide-reaching children’s literature can be. What was it about that class? Peter, of course. Probably also the setting. And the group, the people there. The level two class was something new to me at the time, in that it wasn’t a class you just took once and moved on. There were people in that class who had been coming back for ten or fifteen years, by that point. The class was always the same, and always different, because it was a workshop made up of the people in the room and whatever they were working on at the time. You never knew what you’d learn, or which stories you’d hear. And I did like hearing everyone’s stories. Sharing work aloud, I think, can be an important part of the learning process, for both the reader and the listeners. So be warned — if you’re thinking of signing up for my YA class, there will be a workshopping component! I hope that each of you has a YA project you’re working on, or wanting to work on. If not, I’ll get you started! We’ll also read and hear bits of some really wonderful, recent YA novels and talk about what makes them work — or not work. We’ll be looking into some psychology tools and talking about what it means to be a teen, and how we can use that to deepen our characters and even our approaches to story structure. We’ll be remembering our own teen selves, and mining that rich ground for stories. And, of course, there will be charts. And handouts. Because my brain likes charts and handouts. We’ll look at different genres (fantasy, historical, mystery) and how they are being represented in YA books. We’ll look at the market, too, and the business side of things, and I’ll see if I can convince some of the agents, editors and YA writers I know to join us (maybe via Skype, given the sort of winter we’re having) or at least share their thoughts, but as with most of my classes, the focus will be on your writing. After all, that’s the fun part. I can’t be ‘Yoda’ like Peter, and I’m not laid back like Ted. My teaching style tends to be a little bit more jackrabbity, and I have a bit of an obsession with bristol board. But one thing I can offer, one thing I do have in common with these two and with the other wonderful teachers I heard from at CANSCAIP in January, is a deep-seated love of children’s books. Also a genuine excitement about sharing anything I’ve picked up along the way that can help another writer develop. I have a sponge for a brain when it comes to this stuff, and I like to wring it out during class time. (There’s a lovely, appetizing image for you.) I look forward to hearing your stories, and to helping you make them stronger. Perhaps best of all, there will be cookies. Tea as well, if Shelley will allow it in her absolute treasure of a bookstore. That’s the lasting legacy of my time at Mabel’s Fables — Peter taught me that cookies are a very important component of any writing class. So if you’re thinking of signing up, drop me a line and let me know if you like oatmeal or chocolate chip with your brain-spongings. Remember being a teen? First times. Intense feelings. Everything changing, all at once, as your world seems to grow bigger and smaller at the same time. Join children’s author Erin Thomas for a six-week look at novel writing through a YA- specific lens. Previous writing experience or a course in writing for children is recommended but not required. Erin, what a lovely tribute to Peter, Ted, and the gangs who’ve gathered at Mabel’s. You’re a great teacher. I wish I could take your class.